(Trent Nelson | The Salt Lake Tribune) Students in the South Jordan Middle School Concert Choir look on as boy scouts raise the flag at sunrise to mark the anniversary of 9/11, Tuesday Sept. 11, 2018. 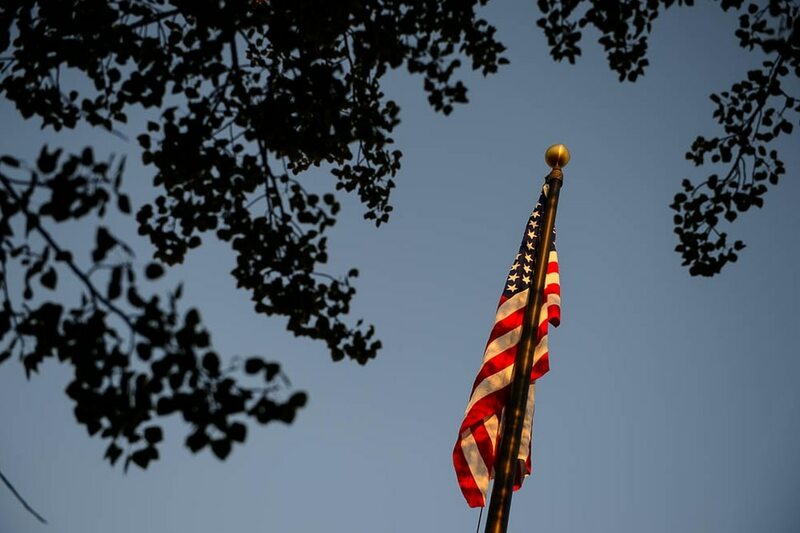 (Trent Nelson | The Salt Lake Tribune) The flag flies over South Jordan Middle School mark the anniversary of 9/11, Tuesday Sept. 11, 2018. 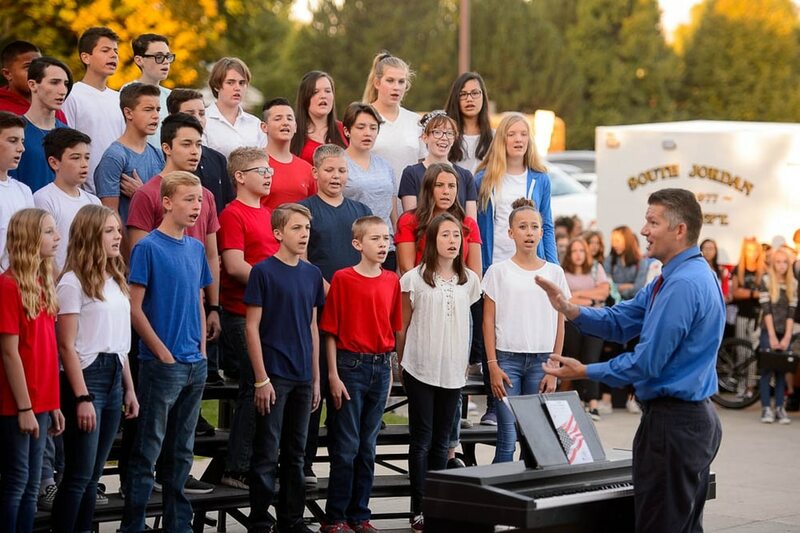 (Trent Nelson | The Salt Lake Tribune) Students in the South Jordan Middle School Concert Choir sing at a sunrise ceremony to mark the anniversary of 9/11, Tuesday Sept. 11, 2018. Conducting is Shawn Kidd. (Trent Nelson | The Salt Lake Tribune) First responders, students and staff recite the Pledge of Allegiance at South Jordan Middle School during a sunrise ceremony to mark the anniversary of 9/11, Tuesday Sept. 11, 2018. (Rick Egan | The Salt Lake Tribune) 3000 flags wave in the grass in front of Skyline High School in memory of those who lost their lives 17 years ago. Tuesday, Sept. 11, 2018. (Rick Egan | The Salt Lake Tribune) Tuesday, Sept. 11, 2018. (Rick Egan | The Salt Lake Tribune) Lillian Edwards, 2 1/2, from Millcreek, walks through the 3000 flags in front of Skyline High School in memory of those who lost their lives 17 years ago. Tuesday, Sept. 11, 2018. (Rick Egan | The Salt Lake Tribune) 3000 flags wave in the grass in front of Skyline High School in memory of those who lost their lives 17 years ago. Tuesday, Sept. 11, 2018. (Rick Egan | The Salt Lake Tribune) 3000 flags wave in the grass in front of Skyline High School in memory of those who lost their lives 17 years ago. Tuesday, Sept. 11, 2018. 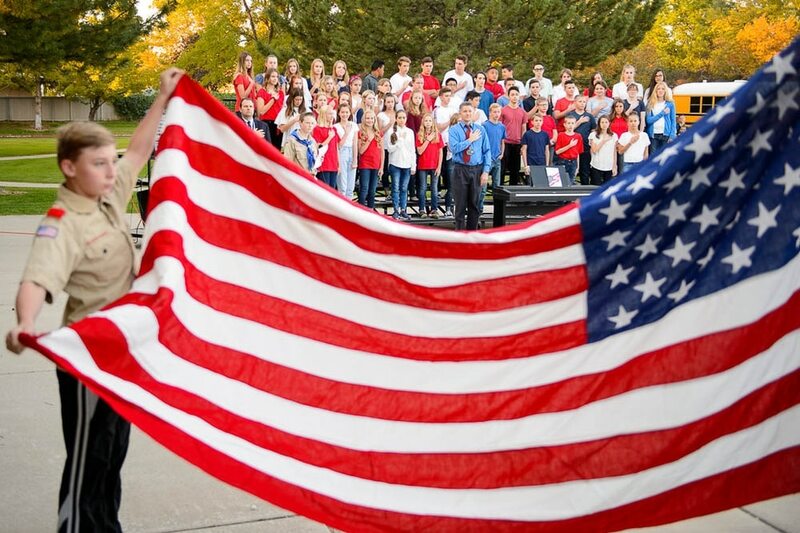 Students paid tribute to members of the military and first responders with a flag ceremony, a moment of silence, a performance by the school’s choir and a singalong. The school said the event makes sure students who weren’t born at the time understand the impact the Sept. 11, 2001, attacks had on the nation. Three thousand flags were on display at Skyline High School in Millcreek in honor of those lost in the attacks.